Binary Star system or Planet? The following two images show the context of this configuration with respect to the scale of the Jupiter-Sun separation in our own solar system. Jupiter is at 5 AU and this object is at 0.05 AU or 100 times closer. The separation from the center of the sun to the planet (in pixel units) is correct on both scales but the size of the Sun is exaggerated. The planet is close to the star but is not in contact with its atmosphere. the temperature at a distance of 0.05 AU (1/6 the distance between Mercury and the Sun) from a solar type star is very high (2-3000 K) and one wouldn't expect a low density (gaseous) planet to form there by any accretion process as the low temperature volatiles would be boiled away. Hence, this object, if its always been at this distance from the star (it would also have to withstand a rather vigorous T-Tauri wind) most likely formed by condensation out of some gaseous nebula (the same way that stars form). The ability for this Jupiter-mass like object to retain its atmosphere depends upon the atmospheric temperature and the escape velocity, which in turn depends on its density. In addition, dynamical heating by solar wind particles may be quite important. The ability for this object to retain a hydrogen atmosphere is considered here . In this hypothetical case, the atmosphere has been evaporated exposing the surface which is probably rocky. If you went to the link considering the retention of the atmosphere, you should realize that its unlikely that the atmosphere has evaporated. On the other hand, perhaps this object is mostly rocky in which case the question becomes, how come such a large mass (150 earth masses) of rock could form there into an object so close to the host star. With a suitable, but rare value for sin i, the mass estimate could be increased up to about 10 Jupiter masses. This raises the possibility that this system is actually a G-dwarf brown-dwarf binary. This would make perhaps a little more physical sense in terms of the small separation but the required parameter space for sin i is pretty small. Its also possible that the object has been captured (an extremely rare event) into this tight of orbit. In any case, as in the surprising discovery of planets around Pulsars, this data shows that our expectations of the formation of planetary systems and where they are located are pretty naive. Clearly, planetary- size bodies are robust and can exist in a wide range of environments. Monitor the primary for photometric variability as a function of orbital cycle. The precision of these experiments has to be at the 0.5% level (e.g. .005 magnitudes). In general, this will be hard. The primary is v=5.4 which is very bright. Short shutter speeds for CCDs are bad because the shutter is certainly not reliable to .005 seconds if your exposure time is 1 second. Hence, one must have a system that allows for exposure times around 10 seconds or greater. A nearby star can be used as a reference and differential photometry can be done - but I don't want to give away any more technique hints as we will try the experiment locally. Why was this object missed:? Herein lies an interesting story of astronomical misclassification. 51Peg appears in the Bright Star Catalog as a luminosity class IV star - a sub-giant. These stars are known to be pulsationally unstable and exhibit sinusoidal radial velocity variations. Hence, these stars are not initially selected for survey. Geoff Marcy's experiment at Lick can achieve a precision of 3 meters/sec. The precision of the Swiss discovery experiment is 15 meters/sec which means they can do good work on pulsational radial velocity variations but are not real sensitive to planetary orbital induced variations. 51Peg was observed as part of their general program but the initial detection of 53 m/s could have been pulsationally driven. The more accurate velocity measurements, however, yielded a precise orbit and eccentricity thereby making the orbital motion interpretation more viable. Had 51 Peg been classified as a luminosity class V star initially, it is likely that this discovery would have been made earlier. Keep in mind that the perturbation that Jupiter exerts upon the Sun is 12 meters/second (quick back of envelope calc - I think its right) so until very recently, this precision was not reachable. Indeed, in addition to the work of Geoff Marcy, the Canada-France- Hawaii Telescope has been used by Gordon Walker of UBC and his team in a long term monitoring program of a couple of dozen solar type stars. Their resolution is 15 m/s and hence that survey also doesn't detect Sun/Jupiter like systems. If Marcy and others get down to the 1 m/s level of accuracy, I am confident that many new perturbations will be detected. Thanks to Geoff Marcy, Robert Casey, Amy Hulse, Jeremy Goodman, David Soderblom and the Adler Planetarium for their contributions. 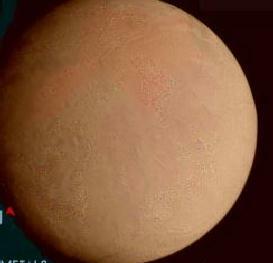 David Hobson would like to name this planet Vulcan.